Unlike most of the papers that have been prepared for the Initiative’s training programs, this paper is very much the creation of one person – Terry Ryan. It is entirely appropriate that it should be so. For much of the past five years Terry has had to immerse himself in research topics which, at least initially, were alien to him – the brain, evolutionary studies, pedagogy, etc. Yet all the time Terry’s natural ‘eye’has been that of economic and social policy. Since late 1995 he and I worked (as he explains) either in the heart of Washington DC or in the wealthiest of all American counties – Fairfax County Virginia. Fairfax County is a large tract of land given to Lord Fairfax in the early 1660s by Charles II in gratitude for Fairfax’s role in restoring the monarchy following the collapse of Cromwell’s Protectorate. As economic and social pressures increase on parents daycare centers, schools, and other formal systems and institutions are being called upon to take a larger role in the raising of children. No longer, it seems, is it politically correct to suggest that children’s learning and development benefit by playing in their own neighborhoods with family and friends from nearby homes; and that these interactions are as important to the healthy development of children as are the ones that take place in a formal setting. As if simply through omission, an increasing number of us have accepted a move towards a post-family and post-community reality. But should we? Can schools replace a larger and larger piece of what families and communities have traditionally done for children? If so, at what cost? Are we as taxpayers really willing to pay for it? But, before we can address these questions fairly we may need to ask ourselves an even deeper one. What do we as a society consider to be a “well-educated child?” In recent history, a well-educated child was one who had a sense of purpose in life. She knew where she came from and where she belonged. She had a strong link to both her family and community, but was also tolerant of those from other backgrounds and places. A well-educated child understood what was necessary to achieve success in a chosen field or profession. She started to dream about what she wanted to achieve and she had the fortitude to do what it took to make her dreams happen. A well-educated child had the capacity to concentrate on one’s activities and was able to appreciate quality. He would have high self-esteem because he knew he was valued and knew he mattered. A well-educated child operated at a high level of literacy and had a thirst for further knowledge, and he understood the value of deferred gratification in achieving goals. A well-educated child was far more than just a productive economic unit. Are these qualities we expect of a well-educated child today, and can they be developed in children by schools alone? Some may say that such comments sound quaint in today’s fast-paced reality. However, we need to remember that we are more than just a technological and economic species. We are also a biological species with a long cultural and evolutionary past, and it is because of this history that we function best in small-groups and are predisposed to thrive among family and neighbors. As Aristotle understood, humans are by nature political and social creatures; they are not isolated and selfish individuals. This fact helps to explain why greatness is usually a team effort. Despite American myths that often exaggerate the role of individual heroes and understate the importance of collective effort history has been made through collaboration. Our inherited predisposition to collaborate and learn in tight knit groups may help to explain why factors outside of the school are four times more important in determining a student’s success on standardized exams than are factors within the school.4 Learning is essentially a social and meaning making activity that often occurs in spontaneous and unplanned ways. Not surprisingly, Wenger continues, “The result is that much of our institutionalized teaching and training is perceived by would-be learners as irrelevant, and most of us come out of this treatment feeling that learning is boring, arduous, and that we are not really cut out for it.”5 The educational researcher Lauren Resnick picked up on the disconnect between formal education and working successfully in the real world when she observed over a decade ago, “Schooling is coming to look increasingly isolated from the rest of what we do.”6 Schools often struggle to go with effective learning strategies because the sheer scale of the enterprise they are asked to carry out requires bureaucratization and standardization. As schools have been asked to do more, so they have physically expanded in size. In the United States, “Research indicates an effective size for elementary schools is 300 to 400 students, and 400 to 800 is appropriate for a secondary school. Yet, from 1940 to 1990, the total number of K-12 public schools fell 69 percent, despite a 70 percent increase in the U.S. population. Consequently, the average school enrollment rose more than five times.”7At the beginning of the 21st century burgeoning school size is accelerating as educators struggle to deal with the demographic cadre known as the “echo boom” – the children of the baby boomers. So, what’s going on here? Some use this historical anecdote to argue that teachers have simply gone soft, and that to develop “well-educated children” we only need to do two things: 1) focus our energies on how teachers teach (i.e. by raising standards, through merit-based pay, etc. ), and 2) increase the amount of time children spend in the classroom. The popular argument is that we are in the midst of an epidemic of school failure. The 21st Century Learning Initiative makes a different argument. 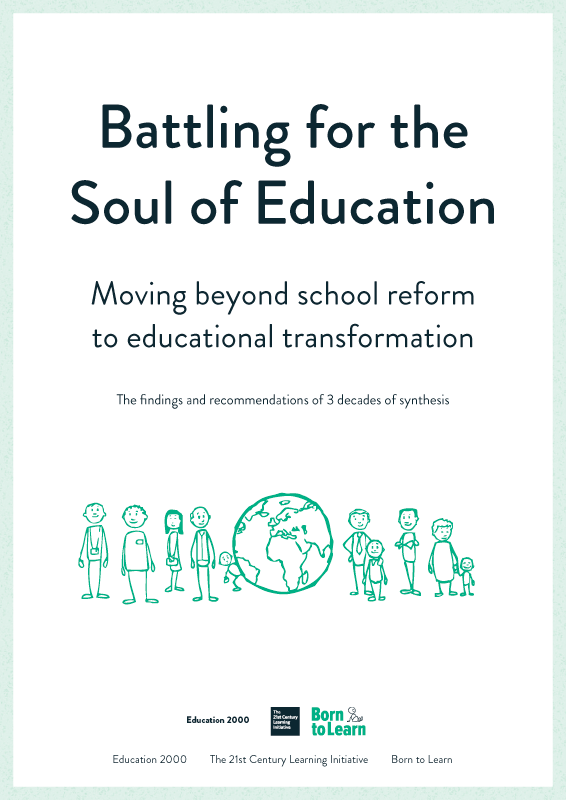 We make two distinct points: 1) we should focus our efforts on how schools are structured (turn them upside down) so they can go with the grain of the brain, and 2) the so-called crisis in schooling is really more a crisis in childhood and community. The Initiative believes in the power of people to come together to do extraordinary things. The remainder of this paper will focus on the Initiative’s second point by looking at the economic and social changes that have roiled families, communities and education over the past several decades. In order to help you put these changes into your local context this paper has put them into the context of Fairfax County Virginia. We have chosen Fairfax because it is a place where both John Abbott and I have lived, and it is one of America’s most dynamic and rapidly changing areas. In many ways, Fairfax serves as a bellwether for what the future may hold for those countries and communities that have embraced go-go capitalism.